From a young age, Heather Scanlon has been practicing yoga and massage. Her father was a new age guy back in the 80’s before yoga was hip! After graduating from Antioch College with a bachelor’s degree in psychology, Heather lived and worked for a year at the Kripalu Yoga Center in Lenox, MA. She received invaluable training and skills from the Kripalu community and went on to continue her education at The Florida School of Massage. Since graduating in 1997, Heather has worked in medical offices, her own massage therapy office and spa settings helping clients with pain relief and relaxation. She has a gentle touch and provides a safe space for people to let go of tension and stress. She believes anyone can benefit from the power of nurturing touch and/or yoga practice regardless of one’s limitations. 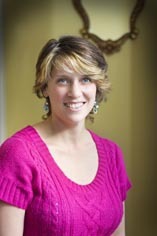 Heather met her husband Chris at a craniosacral course in 2000. After getting married and moving to Syracuse, they founded Health Pathways. Currently, Heather is a actively raising her 3 young children while practicing massage and teaching Yoga.